Maureen Jivani’s poetry has been published online and in print in The United Kingdom, America, Australia and New Zealand. She has an MPhil in writing from The University of Glamorgan. Her pamphlet My Shinji Noon and her first full collection of poetry, Insensible Heart was published by Mulfran Press in 2009. Insensible Heart has been short listed for The London Festival Fringe Award 2010. Maureen lives in Bookham England and is now working on her second collection of poetry and a book of short stories. 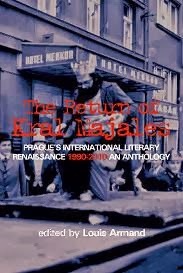 A celebration of the publication of Prague Anthology (1990-2010) called The Return of Kral Majales. The anthology includes the work of over 50 writers/editors/publishers active in Prague international literary community between 1990 and 2010; generously illustrated with archival photos, portraits, film-stills and memorabilia; and complemented by a comprehensive bibliography of English-language literary journals, chapbook series, anthologies, book publications, reading series, festivals, theatre productions and experimental film. Writer/Editor Louis Armand presented an overview of the Prague English-language literary scene, followed by select readings from the publication. 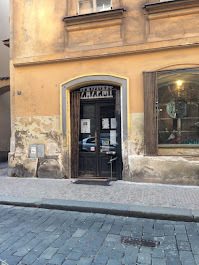 The evening will continue with an open mic of music, poetry and prose, as we embark on the next decade of English-language literature and performance in Prague. Michal Ajvaz, Jorn Ake, Gwendolyn Albert, Hana Andronikova, Louis Armand, Julie Ashley, Alex Barber, Kip Allan Bauersfeld, Kevin Blahut, Petr Borkovec, Sarah Borufka, Michael Brennan, Bil Brown, Anna Bryson, Alexandra Buchler, Isobelle Carmody, Vera Chase, Lou Charbonneau, Julie Chibbaro, Joshua Cohen, Laura Conway, Christopher Cook, Christopher Crawford, Lewis Crofts, Pierre Daguin, Barbara Day, Stephan Delbos, Danika Dinsmore, David Doubek, Daniela Drazanova, Vit Erban, G.S. Evans, Robert Eversz, Vincent Farnsworth, Sylva Fischerova, David Freeling, Jim Freeman, Michaela Freeman, Stuart Friebert, Robert Gal, Thor Garcia, Myla Goldberg, Elizabeth Gross, Bernie Higgins, Stuart Horwitz, Howard Hunt, Travis Jeppesen, Ivan Martin Jirous, Alexander Jorgensen, Richard Katrovas, Jane Kirwan, Jana Klepetarova, Eva Klimentova, Vit Kremlicka, Maya Kvetny, Toby Litt, Christopher Lord, Paul Martia, Jason Mashak, Tom McCarthy, John McKeown, Maureen McManus, Joshua Mensch, Tomas Mika, Ewald Murrer, Ken Nash, Scott Jonathan Nixon, Andrew Oakland, Peter Orner, Tony Ozuna, Iva Pekarkova, Katerina Pinosova, Jaroslav Pizl, Magdalena Platzova, Paul Polansky, Justin Quinn, James Ragan, Martin Reiner, Tim Rogers, Katerina Rudcenkova, Jaroslav Rudis, Simon Safranek, Revan Schendler, Theodore Schwinke, Patrick Seguin, Bethany Shaffer, Joe Sherman, Phil Shoenfelt, David Short, Howard Sidenberg, Jenny Smith, Donna Stonecipher, Holly Tavel, Jeri Theriault, Alan Ward Thomas, Anthony Tognazzini, Lukas Tomin, Nicole Tomlinson, Jachym Topol, Petra Vachunova, David Vichnar, Lawrence Wells, Alice Whittenburg, Clare Wigfall, Laura Zam, Lucien Zell, Alex Zucker. Louis Armand is director of the Centre for Critical and Cultural Theory in the Philosophy Faculty of Charles University, Prague. His work has appeared in TriQuarterly, Poetry Review, Sulfur and Stand, as well as The Penguin Anthology of Australian Poetry, The Best Australian Poetry 2008, and Calyx: 30 Contemporary Australian Poets. He has published books of criticism and prose fiction as well as a number of collections of poetry, including Inexorable Weather (Arc, 2001), Land Partition (Textbase, 2001), Strange Attractors (Salt, 2003), Malice in Underland (Textbase, 2003) and Picture Primitive (Antigen, 2006). He is the editor of Contemporary Poetics (Northwestern UP, 2007) and co-editor of the journal VLAK: Contemporary Poetics and the Arts. Elizabeth Baines is the prizewinning author of prose fiction and plays for radio and stage. Her short-story collection, Balancing on the Edge of the World, was published by Salt in 2007 to much acclaim. Salt also published her new book, Too Many Magpies, a novel about our rational and irrational fears in a changing and newly precarious world.